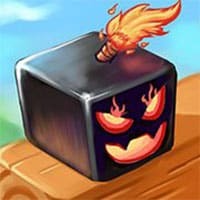 Bomb Destroyer is a block removal game where your mission is to destroy various blocks without letting the bomb fall to the ground. Use balance to keep it up. A cool physics based puzzle game! Wooden box can be destroyed, but stone can’t. Be careful, Don’t let the bomb fall to the ground. At each level in this game, you have fixed number of breaking, After you used all breaking and the bomb doesn’t fall to the ground, you pass the level. Or you fail. Enjoy and have fun in playing this game. Bomb Destroyer is a free online puzzle game on Round Games.